White Cloud, is a wooden yacht that will allow you to go back in time, back to the days in which man first started exploring the world. The feel of wood is a very homely feeling, touches the heart in places other types of material don't. This feeling lasts with you even hours after the cruise is over. As the waves crash against the shore, you feel the light breeze up against you and the excitement of the journey fills your body. You are ready to take a once in lifetime journey into the marvelous open seas. When you hire the White Cloud, whether a few hours or for many days, you're actually renting the oldest means of transportation that humankind has used to journey the seas. This experience wiill carry you far away from civilization, away from the material world, and deep into the heart beyond of the great blue sea. The White Cloud sailing yacht, offers a full range of romantic getaways for couples. In addition, families and friends who want to enjoy sailing the open air and want to embark on fishing and other relaxing ventures are invited to join the calm quietness of the open seas. "Window to the Mediterranean" – The first ype of yachting option is called "Window to the Mediterranean". This is the shortest route that we propose for applicants who want to gain some familiarity with the sea, with the possibility to spend pleasant and enjoyable hours on board a yacht. Sailing on the yacht during this track , you'll get a taste of the exciting and relaxed life of a marine shipper. During the cruise, this type fo route can also be given as a present by someone to his partner if they would like a few hours to have a romantic getaway. Sitting in this romantic setup, you can enjoy cold drinks and fresh, delicious and varied foods that offer a romantic couple a luxurious willow palate. "Marina" – The second type of yachting option is the legendary cities tour called "Marina". 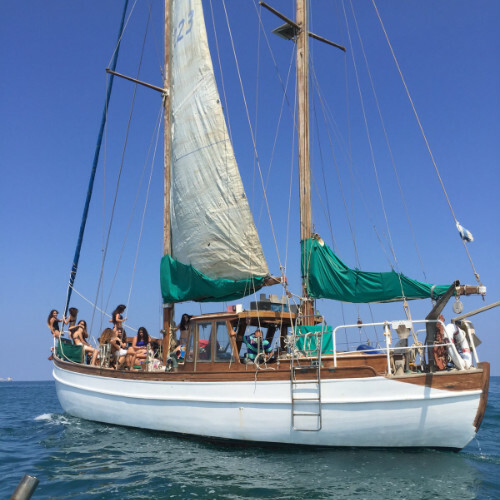 On this trip on the White Cloud, you will travel to the Old City of Acre, Haifa, and from there we will continue to sail to Nahariya, Tel Aviv and Jaffa. Upon arrival with our yacht to any city, you can go out and spend time at every site at which we ancor, and once you are done there we can continue back aboard and onward on our trip. The route also includes a tutorial on how to run a yacht and how a ship works in general. In addition and as customary, we will offer excellent food and delicious foods at all times of the cruise to add to the atmosphere. This trip runs across most of the coast of Israel and has a duration of about 48 hours. "New Country" – The third type fo yachting option is called "New Country". In this option, you choose the destination country or the city you wish to travel to sea, and you set the length of the voyage. During the trip on the White Cloud, you will learn how to run a yacht on your own, which will integrate real life yachting with most general shipping procedure. "S Heart"- A fourth type of yachting option is called "S Heart" This unique course that is offered to visitors on board the White Cloud yacht, allows you to study different marine technologies and electronic equipment which is used to locate points of interest that are selected. These types of techniques can be used when you are at sea and you are down on the deck of the yacht and you want to produce great fishing results and a great cruise you will be able to handle yourself and know what to do. You must ask yourself, is this yacht suitable for my needs? Well, the White Cloud has a fully equipped kitchen, gas stove, refrigerator, freezer and of course air-conditioning. When night falls you can indulge in 4 double beds, made out of comftorable red cloth which ismade pleasant. Arrow images to the yacht's womb. depth. An integral part of the departure to the sea is the physical preparation. Those who have sea sickness are advised to take pre-emptive caution and prepare themselves for this trip as there a lot of waves. If you do not know if such a tendency exists, we can always take care of before or after. We offer naturally based pills such Travamin an hour before departure. For more information on the pill click here. According to my father, Colin Archer's, construction concept model of the White Cloud, the yachy is stable and offers much stablity. Therefore, this yacht design offers sailing solutions to different kind of waves that could damage the ship such as "bow waves". Colin Archer is designs ships for south and north pole travelers and White Cloud is designed for such harsh conditions. For more information about yacht builder.